How could I NOT post this Venus transit picture? I wasn’t going to post another Venus Transit shot, because my mousing arm still hurts from putting together the gallery for this morning. But holy geez, I saw this, and c’mon! This image of Venus as it entered the Sun’s disk was taken by the NASA/JAXA (Japanese space agency) spacecraft Hinode on June 5. The detail is breathtaking. 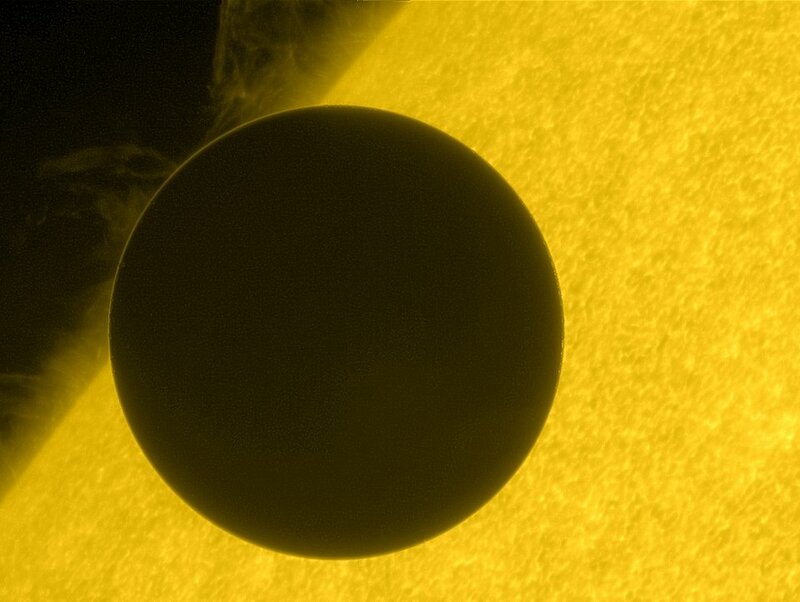 The ring around Venus is due to scattering and refraction — light from the Sun passes through the upper part of the Venusian atmosphere and gets bent toward us. You can also see some texture on the Sun’s surface (really packets of hot gas rising and cool gas sinking) and some nice prominences off the Sun’s limb — material lifted against the Sun’s massive gravity by its equally ridiculously strong magnetic field. That’s a whole planet there, folks, nearly the same size as Earth, roughly 40 million kilometers (25 million miles) from Earth, back lit by a star 110 million km (70 million miles) farther away yet and well over 100 times bigger than Venus! And we knew about it, predicted it, aimed our machines at it, and observed it so we can learn more and see more beauty. The things we humans do when inspired by the Universe. Amazing.